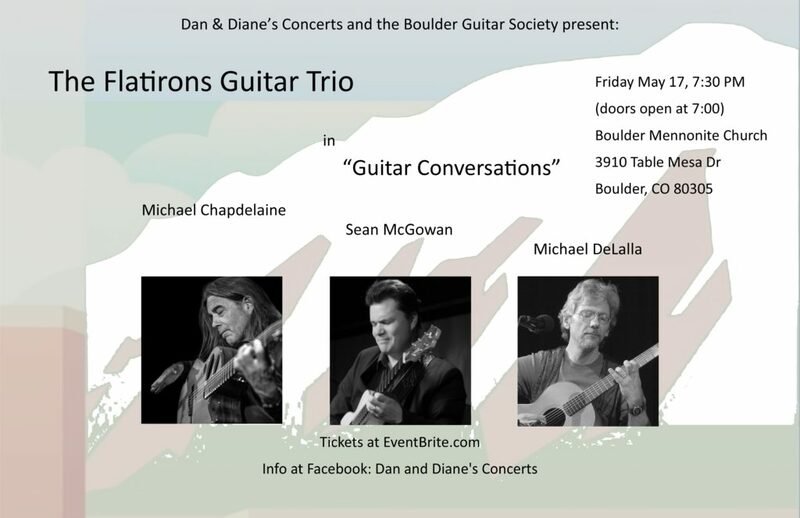 The Flatirons Guitar Trio: three distinct guitar voices, Michael Chapdelaine, Sean McGowan and Michael DeLalla, come together for “Guitar Conversations” to explore the rich and varied musical terrains they’ve traversed in fingerstyle, jazz, classical and world traditions. 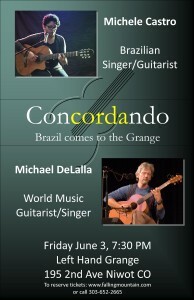 Join them for this special musical journey. Click here for pricing, workshop outline, and travel information. 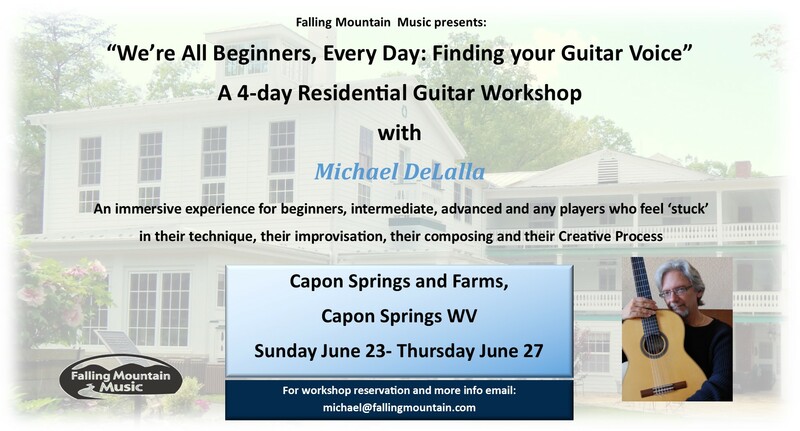 To learn about all that Capon Springs has to offer, visit https://www.caponsprings.net. The final performance from the 2018 PAVAN workshop in Stephens City VA, Benjamin Verdery’s “Scenes from Ellis Island”, performed by the guitar orchestra, with soloists, including Kevin Vigil‘s absolutely beautiful playing. 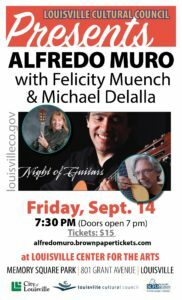 Joining the guitar orchestra are members of the Voice Division, readings by the Theater students and works by the Visual Arts students featured in a slide show that was projected during the piece. Great work, everybody. It’s been some years since I’ve visited this lovely gathering. I’ll be taking the stage at 6:15 PM. 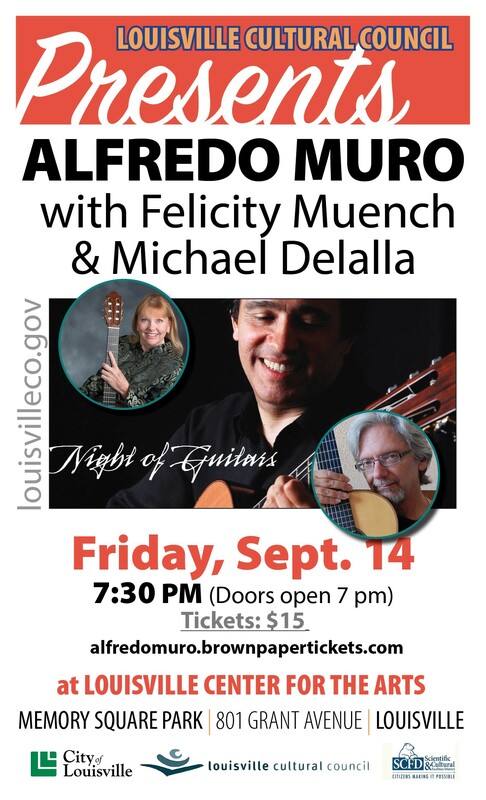 I’d love to see my DMV friends there. Gates open at noon, music starts at 1pm. Camping and late night jams/song circles after Main Stage ends (about 10pm). Pancake breakfast for all campers Sunday morning. It was a lovely visit to storied Dockside Studio in Lafayette, LA, where the likes of BB King, Dr. John, CJ Chenier and countless other legends have put down some truly immortal tracks. Located on a 12 acre estate in the heart of Cajun country on the banks of the Vermilion Bayou, it was where I met up with Terrance, Danny and ace engineer Justin Tockit to finish up recording my score for the video trailer of “Lullaby Road.” This beautiful novel by James Anderson practically wrote the music for me, with its setting in the Utah desert I visit frequently, and its cast of rich characters. It’s been a pleasure bringing this project to life. I’ll be posting more as we approach completion. The “Ampersand Tour’ is aptly named, as I’ll be sharing stages with some special people. 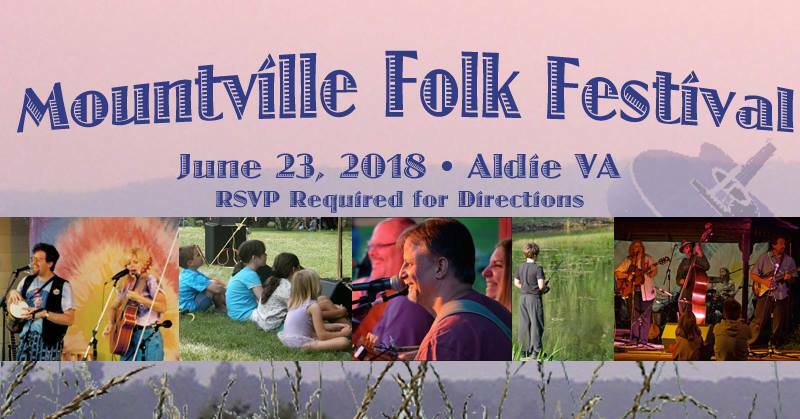 Kicking it off is a concert with my old friends The Unfortunate Rakes, a ‘conversations with guitars’ with Canadian fingerstylist Bob Adern, a guitar summit with Canadians McKinley Leonard-Scott, Tim Pence and Bob Adern…and more surprises to come. Stay tuned for updates. 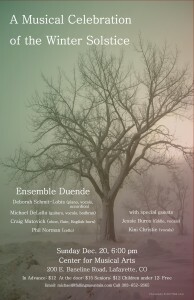 Scores and Sheet Music now available as downloadable .pdf’s. Click here to see excerpts and purchase scores. Coming soon: I’ll be adding some of my pieces for guitar and other instruments, in full score and parts, including oboe, flute, violin, saxophone (soprano, alto, tenor), English horn, clarinet, cello, bass. Need a custom part? No problem; just ask. 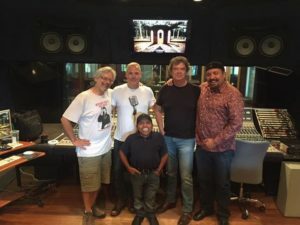 After returning from a month of touring, I was gone for 10 days in September for Florida to produce dulcimist Marcille Wallis’ latest recording, with her full band. I’ve lost count, but Marcille and I have worked together now on a lot of music over the years. I’m finishing up the mixes and mastering. I’m looking forward to it, as I know she and the band is. I’m also looking forwtard to keeping it local to Colorado for a little while–that was a lot of miles this summer! Click here for a little guided tour of the tour. Oct. 26: Guitarists in the Round, Front Range Community College, Westminster Campus. 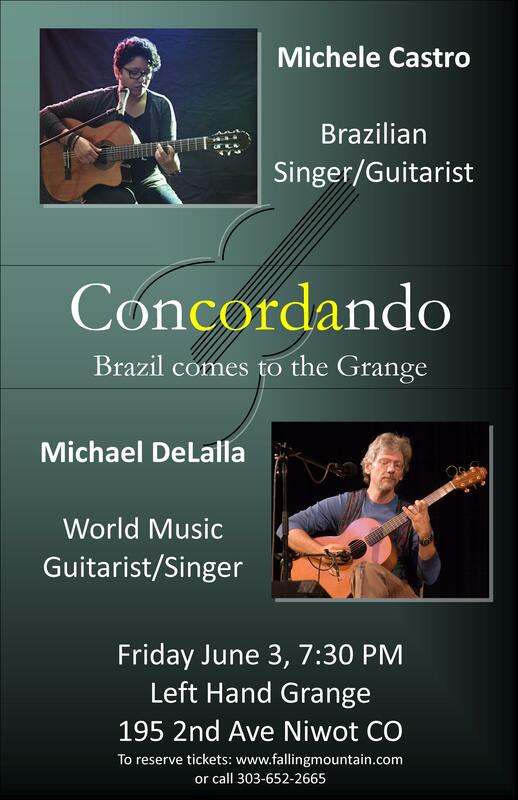 Guitarists from across the stylistic spectrum in one evening. 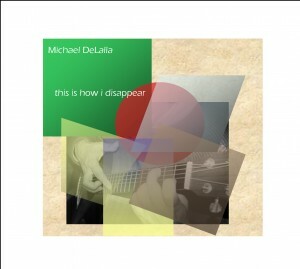 Happy Spring from Michael DeLalla! 2016 promises to be filled with lots of good music and travels. 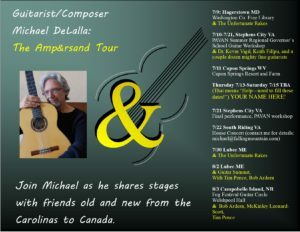 The performance schedule is progressing, with solo guitar shows, concerts with Ensemble Duende, a Colorado tour with The Unfortunate Rakes (March) and a solo east coast tour in June/July. Stay tuned for calendar updates. Duende is the spirit of evocation. It’s what brings forth a physical or emotional response to art, the chill down the spine, the irrepressible sigh, smile or tear when experiencing an expressive artistic performance. 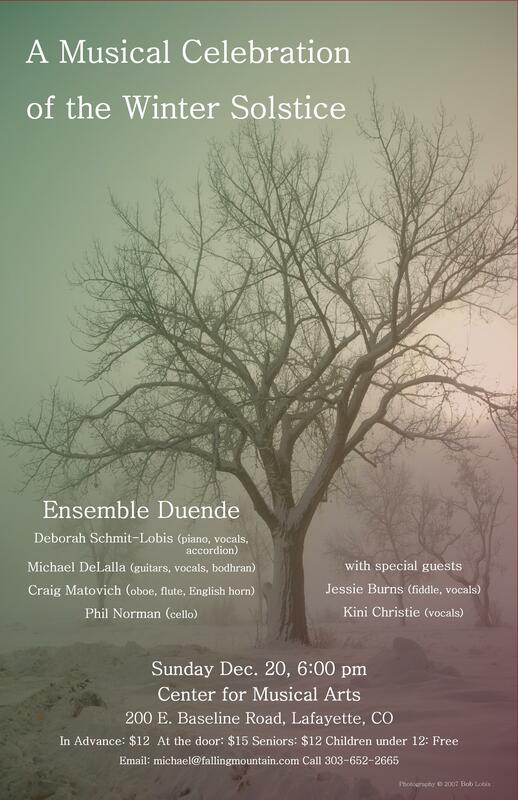 With Ensemble Duende, it’s the very essence of their music, whether drawn from their classical training or the varied traditions found in the music of other cultures, or their intuitive improvisations. 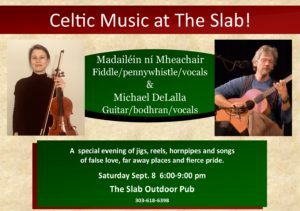 It’s a soul-sharing, a most intimate connection between the performers and their audience. It’s that time of year when I head to the east coast, a nice mix of concerts, workshops and a few private lessons (I have room for a few more, so hit me up if I’m coming through your town). This year, I’ll have my new book “The Mindful Guitarist” on the sales table. 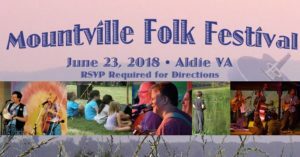 I’m also looking forward to sharing some stage time with some special friends, notably fiddler Carrie Bartsch and singer-songwriter Andrew McKnight. As usual, I’ll be writing about the tour in ‘Michael’s Blog’, so tune in when you can. You can also read it on Facebook. Remember when it comes to schedules, things happen…always check with a venue, or drop me a note. Here’s hoping to see you at a show. A great trip to the Northwest, including some mid-tour R & R on the San Juan Islands, then back home to Colorado for a cup of coffee and a load of laundry before packing and leaving for the east coast tour. What a fabulous trip it’s been–be sure to read “Michael’s Blog” for more fun and insights. 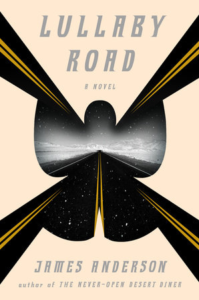 Now, time to finish the book, then hit the road again…Thanks to all of you who make it out to the shows and buy the music–your support and friendship has my undying gratitude. 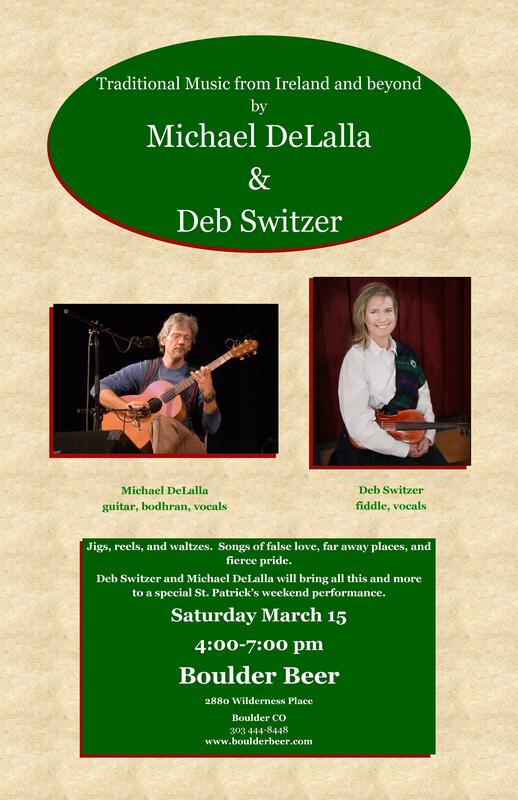 Fiddler extraordinaire Deb Switzer joins me for an afternoon of jigs, reels, hornpipes and songs from Ireland (and all the Celtic lands). It’s been a few years since I’ve been to the Northwest but I’ll be making concert stops in Idaho, Montana, Oregon and Washington (hoping to also land a Vancouver BC show). Also on the schedule is a pair of workshops at Dusty Strings in Seattle. 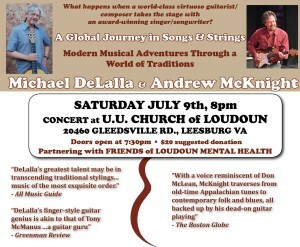 Then I come home, unpack, do some laundry and head off for an East Coast tour. Stay tuned for updates and more details–of the shows and workshops, not the laundry. Every year EC culls from the wealth of music she encounters for airplay on her KGNU-FM radio shows “Musica Mundi,” “The Heavy Set” and “Sound Lab.” You’ll find plenty to add to your iPod. 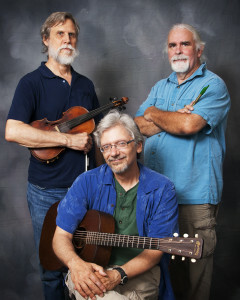 Read about the artists and follow links to their music on EC’s Blog. Seven weeks. 8047 miles. Incalculable memories. I’m back in Colorado after a great summer tour. If you missed my ongoing blog you can still check it out here, at Michael’s Blog—so many good stories! Photos and video coming soon. After a little time to get re-acclimated to the Front Range I’m back to work on filling the calendar with shows and workshops. I’m way overdue to revisit the West Coast and Northwest—any ideas or offers to host a concert are welcome. 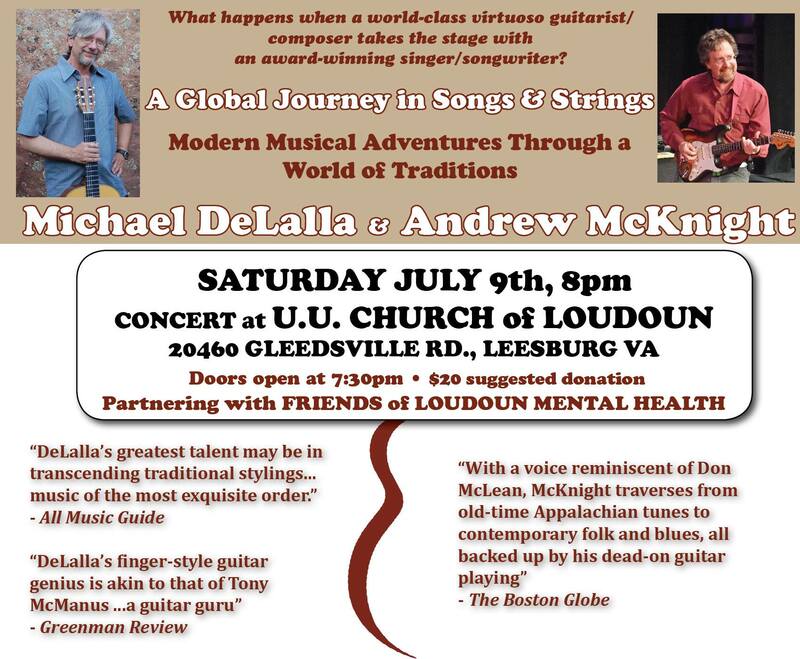 I’m also hoping to get to do some shows in the Southern states in the coming year. And finally, I need to schedule some shows right here in Colorado. I’ll keep you posted here on the website. “Seeking Wellness”, a new film about holistic medicine by Colorado native Rich Lukon, premieres Monday September 23, 6:00 PM at the Longmont Senior Center. Lukon will host a discussion about his work after the showing. I will be at the premiere, as will those featured in the film. More details to come. Michael DeLalla’s new CD: “This is How I Disappear” is getting nice press! Click here and scroll down for the complete review. 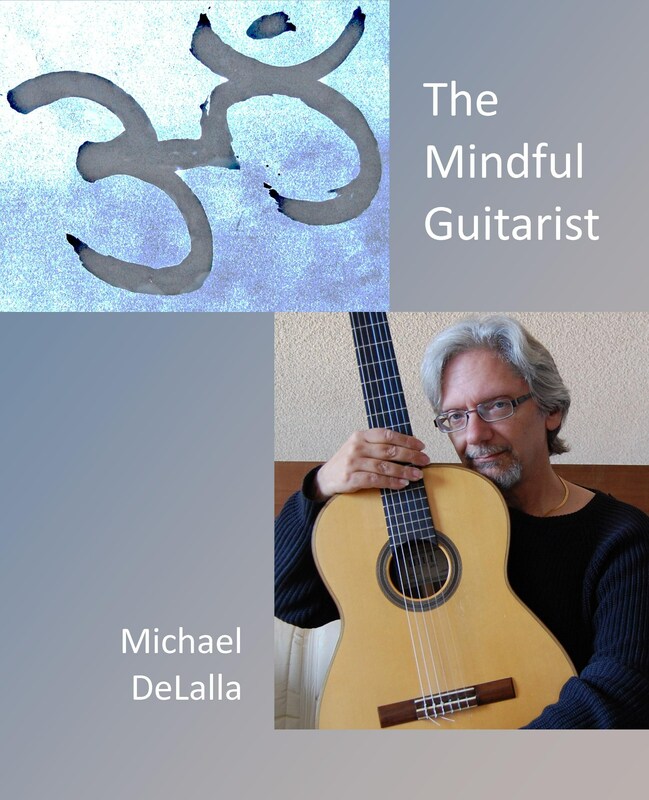 Autumn finds guitarist/composer Michael DeLalla back in Colorado after a summer tour in the mid-Atlantic. 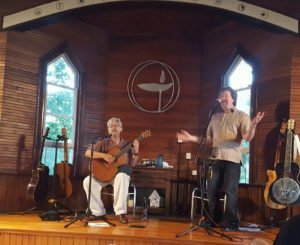 Performances were in a variety of settings: solo concerts to celebrate his new release This Is How I Disappear, a show with his longtime partners in Celtic music The Unfortunate Rakes, a concert with National Autoharp Champion Bonnie Phipps, and a two-week guitar workshop. Check back frequently for newly added shows. Six weeks. 8711 miles. I don’t think I’ve ever played a more gratifying tour–great venues that let the music sparkle, great audiences to soak it up. I can’t thank enough the wonderful radio and press along the way. And all the extras: plenty of sightings of old friends, lots of new friends, great regional food (I love this part of the job! ), plenty of opportunity to soak up the varied cultures that comprise us. Thank you. 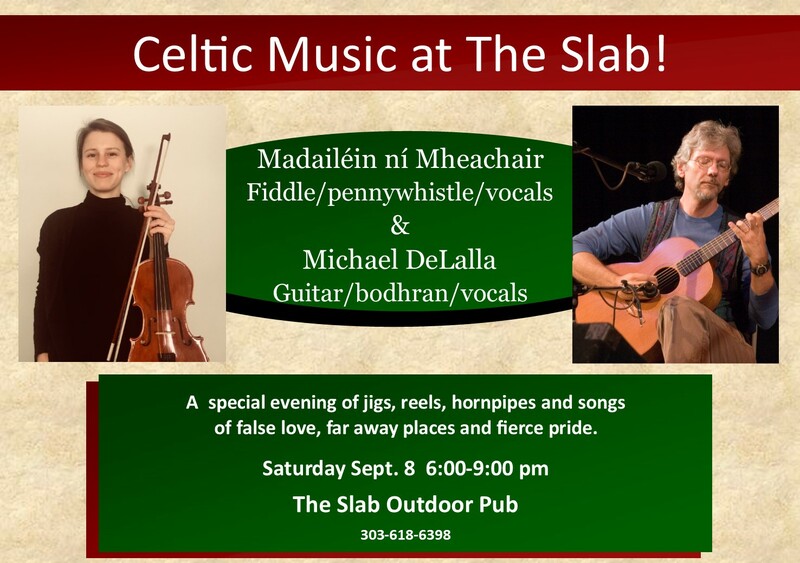 Back in Colorado now, with a slate of shows close to home–a great opportunity to connect with my Front Range friends. Check the Events sidebar for updates and more details.